2.Administrator � Browser based interface to all daemon functions, allowing user to securely administer the LinkDriver daemon via the Internet. Allows user to fully optimize and package dynamic web sites. Administrator System requirements: Microsoft IE 5 or above must be installed on Administrator computer. Supported in Windows 2000, Windows XP, and Window ME. Server System requirements: RedHat Linux 7.0 or later or compatible Linux build, at least 50MB free disk space, 32MB free RAM, root access for install. Priced per physical server, unlimited CPUs. 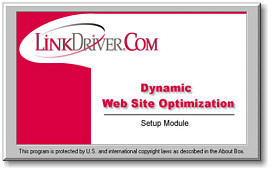 info@linkdriver.com Copyright © 2003 LinkDriver.com, LLC All Rights Reserved.